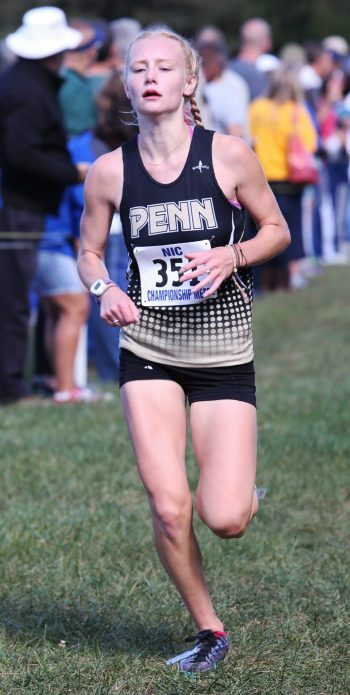 Penn Senior Danielle Spring went into the Girls Cross Country Regional race on Saturday, Oct. 14, with the hope of breaking her 19:11 time and getting her reasonable goal of 19:00. She left with a Regional Championship. Spring ran the 5K course at Ox Bow Park in 18:53.8, taking first place with a dramatic lunge at the finish line to beat Morgan Dyer from Elkhart Memorial. Spring’s Regional Championship effort helped Penn win the team title and advance to the Semi-state. Although Spring surprised herself with her first major championship, her coach was not surprised. “While the crowd, and Dani herself, were certainly surprised by her win, I was not,” Penn Girls Cross Country coach Michael Clements said. “I have had a lot of belief in Dani for the three years I’ve coached her and this year has been a breakout year for her. I think after Saturday’s win, she is starting to realize what I’ve been telling her about how good she can be. Spring said that to achieve her original goal of a time of 19:00, she needed to stay in the front pack. “I was so happy, I couldn’t stop smiling,” Spring said. As the Semi-state and State inch closer, Spring plans to continue what she has done all season to prepare herself, run everyday. She is going into these next few races with a positive mindset.